Follow the instructions in the tabs to validate app protection settings on Android or iOS devices. After you set app configurations for Android devices to protect the apps, you can follow these steps to validate that the settings you chose work. First, make sure that the policy applies to the app in which you are going to validate it. 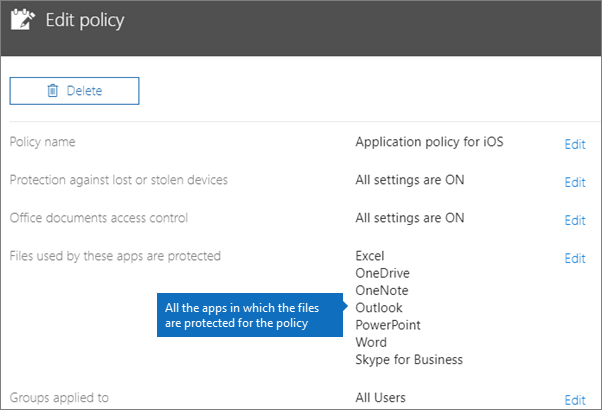 In the Microsoft 365 Business admin center go to Policies > Edit policy. Choose Application policy for Android for the settings you created at setup, or another policy you created, and verify that it is enforced for Outlook for example. 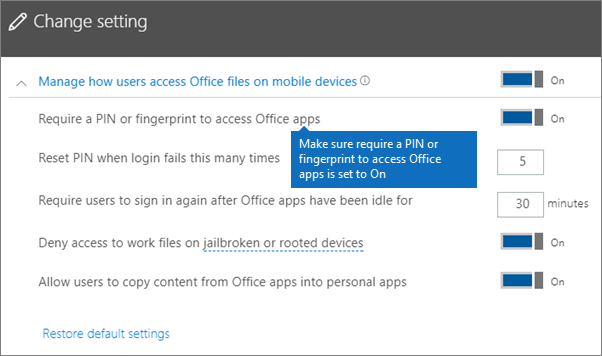 In the Edit policy pane, choose Edit next to Office documents access control, expand Manage how users access Office files on mobile devices, and make sure that Require a PIN or fingerprint to access Office apps is set to On. In the user's Android device, open Outlook and sign in with the user's Microsoft 365 Business credentials. You will also be prompted to enter a PIN or use a fingerprint. In the Edit policy pane, choose Edit next to Office documents access control, expand Manage how users access Office files on mobile devices, and make sure that Reset PIN after number of failed attempts is set to some number - this is 5 by default. 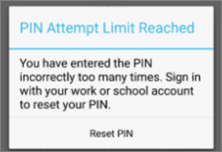 Enter an incorrect PIN as many times as specified by the policy. You will see a prompt that states PIN Attempt Limit Reached to reset the PIN. Press Reset PIN. You will be prompted to sign in with the user's Microsoft 365 Business credentials, and then required to set a new PIN. 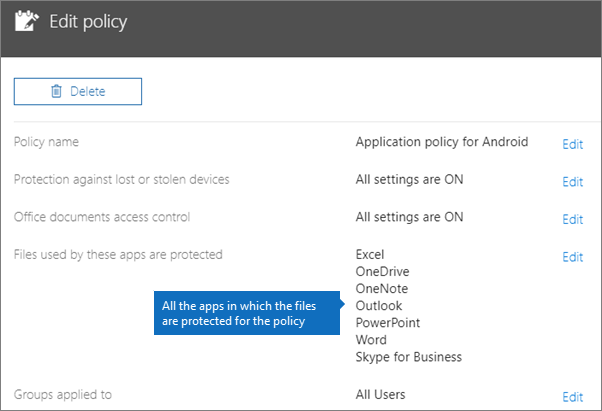 In the Edit policy pane, choose Edit next to Protection against lost or stolen devices, expand Protect work files when devices are lost or stolen, and make sure that Force users to save all work files to OneDrive for Business is set to On. 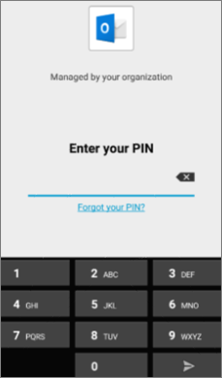 In the user's Android device, open Outlook and sign in with the user's Microsoft 365 Business credentials, and enter a PIN if requested. Open an email that contains an attachment and tap the down arrow icon next to the attachment's information. You will see Cannot save to device on the bottom of the screen. Saving to OneDrive for Business is not enabled for Android at this time, so you can only see that saving locally is blocked. In the Edit policy pane, choose Edit next to Office documents access control, expand Manage how users access Office files on mobile devices, and make sure that Require users to sign in again after Office apps have been idle for is set to some number of minutes - this is 30 minutes by default. You should now see Outlook's inbox. Let the Android device idle untouched for at least 30 minutes (or some other amount of time, longer than what you specified in the policy). The device will likely dim. Re-access Outlook on the Android device. You will be prompted to enter your PIN before you can access Outlook again. In the Edit policy pane, choose Edit next to Protection against lost or stolen devices, expand Protect work files when devices are lost or stolen, and make sure that Protect work files with encryption is set to On, and Force users to save all work files to OneDrive for Business is set to Off. 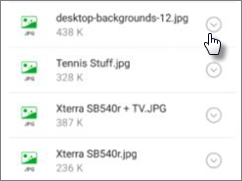 Open an email which contains a few image file attachments. Tap the down arrow icon next to the attachment's info to save it. You may be prompted to allow Outlook to access photos, media, and files on your device. Tap Allow. At the bottom of the screen, choose to Save to Device and then open the Gallery app. You should see an encrypted photo (or more, if you saved multiple image file attachments) in the list. It may appear in the Pictures list as a gray square with a white exclamation point within a white circle in the center of the gray square. After you set app configurations for iOS devices to protect apps, you can follow these steps to validate that the settings you chose work. In the Microsoft 365 Business admin center, go to Policies > Edit policy. Choose Application policy for iOS for the settings you created at setup, or another policy you created, and verify that it is enforced for Outlook for example. In the user's iOS device, open Outlook and sign in with the user's Microsoft 365 Business credentials. Press OK. You will be prompted to sign in with the user's Microsoft 365 Business credentials, and then required to set a new PIN. 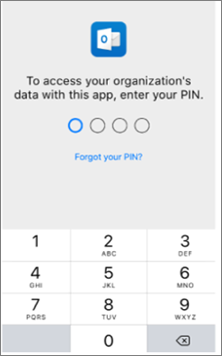 In the user's iOS device, open Outlook and sign in with the user's Microsoft 365 Business credentials, and enter a PIN if requested. Open an email that contains an attachment, open the attachment and choose Save on the bottom of the screen. You should only see an option for OneDrive for Business. If not If not, tap Add Account and select OneDrive for Business from the Add Storage Account screen. Provide the end user's Microsoft 365 Business to sign in when prompted. Tap Save and select OneDrive for Business. You should now see Outlook's inbox. Let the iOS device untouched for at least 30 minutes (or some other amount of time, longer than what you specified in the policy). The device will likely dim. Re-access Outlook on the iOS device. Tap the attachment and then tap the Save option under it. Open Photos app from the home screen. You should see an encrypted photo (or more, if you saved multiple image file attachments) saved, but encrypted.